Happy Thursday! Time the share the last of the new patterns, the Simply Sampled Quilt Pattern! This is a skill-building sampler quilt I designed for the Block of the Month Club we run at The Sewcial Lounge. Knowing that many students would have little to no quilting experience, I wanted them to learn something every session! So, there are lots of different techniques covered in this pattern. 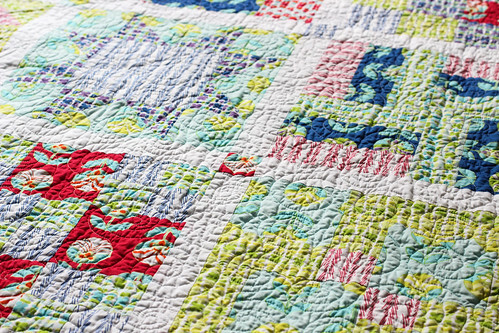 There are half-square triangles, quarter square triangles, flying geese, strip piecing, and more. Most of the techniques are repeated at least once so that by the end of the quilt, it should really sink in! 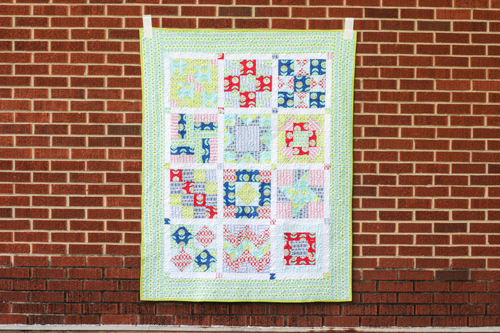 I made the blocks for this quilt during our first round of block of the month club in 2013. I finally put it together this Spring! The quilting was done by Melissa of Sew Shabby Quilting. 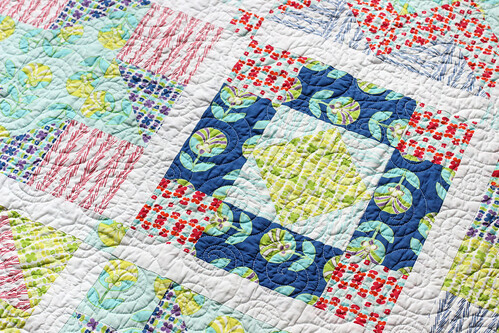 I can never resist swirls, and I love how this quilt turned out! 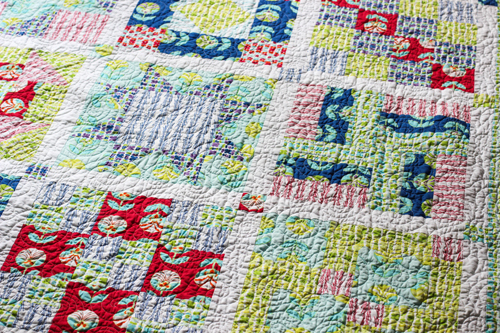 Sometimes you just need some fun, all-over quilting! I bound this puppy up in Oval Elements in Green Apple by Art Gallery Fabrics. As it turns out, I am addicted to green bindings, I have used lime green for binding on NINE quilts! Oh well, it's just too perfect! I used my Color Me Retro collection for the top and back, with Pure Elements in Snow for the sashing. We still have a spot left in our September - December session of Block of the Month club! There is a January - June session scheduled as well! Sign up here! 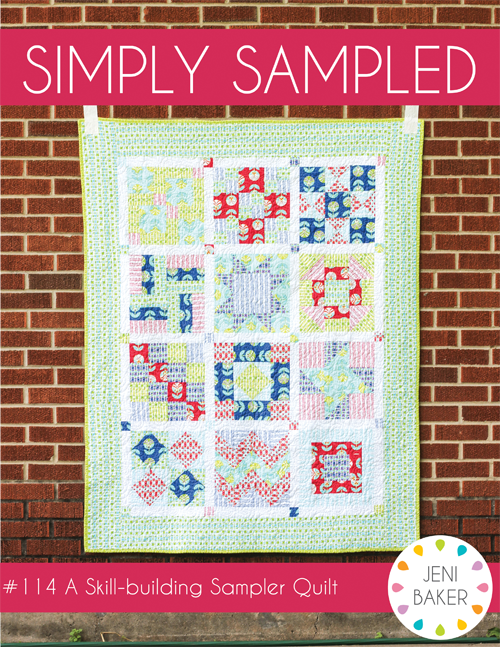 You can find the PDF and paper versions of the Simply Sampled Pattern in my shop! What an absolutely gorgeous quilt. The light green border fabric is absolutely perfect - I am enamoured with this colour lately!!! I like Green fabrics in quilts too and that is ironic given I am not a huge fan of greens. 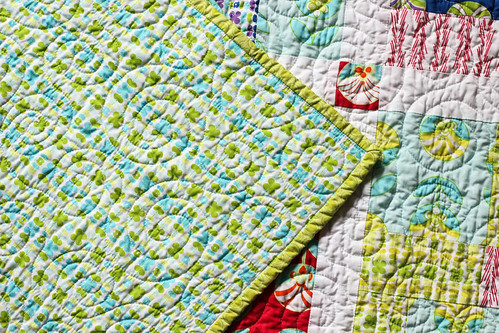 Upon reflection, I think I like the greens because it complements the reds and pinks that I use so much in my quilts. I think this pattern is so cute! Have you ever thought about hosting a sew along on the blog using it (for those of us who are too far away to attend your class)? ?